We spend our summers (and a couple months of winter) in the mountains above Boulder, Colorado. Our cabin is at 9,000 feet. 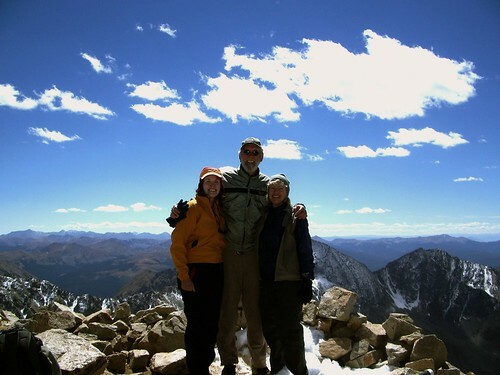 We love spending time in the wilderness of the Rockies, often hiking or skiing above treeline (11,000+ ft.). As a 59-year–old from Atlanta, I struggle with the altitude up here. When we first started coming out, I used to joke that I got out of breath turning over in bed at 9,000 feet. The simple plan that has gotten me above 14,000 feet two times also holds true for my spiritual journey: slow, but relentless. Our best friend out here is Beverly Gholson, a woman I have known since third grade. She has lived in Boulder for a decade now. Beverly typifies the Boulder culture; this place is Mecca for outdoor sports enthusiasts. She has climbed Kilimanjaro, been above 19,000 feet on three continents, and bivouacked overnight on the sheer face of the Diamond on Long’s Peak, a world-class climbing destination. We were too intimidated even to go hiking with Beverly for the first two years we lived here. We did not want to admit our weakness trying to keep up. People out here are fitness fanatics. The road up to our little town from Boulder is only 18 miles, but it gains 4,000 feet in elevation. We see more bicycles on that road than cars. For fun, people ride up to the little country store, grab something to drink, turn around and scream down the hill back to town. They think this is normal. Perhaps that’s why Colorado has the lowest per capita incidence of obesity in the country. When we began to hike with Beverly, we found her to be a great coach. She encouraged us to push ourselves, to go beyond our limits, to chart new territory, to take measured risks. She’s always upbeat, telling us how great we’re doing. She makes us feel good about our progress, no matter how slow. We knew she had walked these pathways before. Her confidence in us gave us confidence in ourselves. We trained hard to reach the goals we set together. We pushed harder each week, set a tougher goal, and made it happen, with her encouragement. Mentors and coaches have been the primary lever behind my growth as a leader over the last 30 years. Having a guide who has been down the road before is an incredible blessing. Those who have seen over the horizon can alert us to the pitfalls of the journey, give us gems of learning that have come through the experience of being on the trail. I have mentor relationships that have lasted 25 years, and continue today. These friends saw potential in me than I could not see myself. Seeing them at regular intervals each year held my feet to the fire to reach the potential they saw in me. My spiritual growth from my baptism as an adult is directly related to the extent that I have put myself in accountable relationships with mature spiritual leaders. I relish the time that I have spent sitting at the feet of these spiritual mentors. “Find your pace and just keep moving,” Beverly says. She helped us see that the key was to keep moving, however slow. Find a sustainable pace, and stick to it. (Mine is two steps per breath, hiking or running. When my breathing goes to one breath per step, I cannot keep it up.) Whenever you stop and take a rest after significant exertion, the lactic acid immediately begins to build up in the muscles. Every time, it is more difficult to start up again. Every time you stop the journey, it is harder to start back up. Hence our motto: slow, but relentless. That plan has gotten me to the top of two “fourteeners” (mountains over 14,000 feet). As we hike with Beverly, people often pass us on the trail, moving ahead at great speed. Soon, we find them resting on the side of the trail. This pattern often repeats several times on a hike, and often we find ourselves first to the top. Here Genie and I are atop 14,003 ft. Mt. Huron with Beverly. I find that “slow but relentless” is a great analogy for my spiritual life as well. In my spiritual journey, I have had the wonderful experience of the mountaintop from time to time. The Spirit has touched me in powerful ways that have shaped and molded my adult life. After each of these experiences, I have found myself back in the valley, trying to hold onto the glimpse of the divine as the worries of the world rush back into my life. As I look over the 25 years since my baptism into the faith, I see that the mountaintop experiences were incredibly valuable, but my spiritual journey is much more shaped by slow, relentless movement forward than any great leaps and bounds. We never know when the still, small voice of God will speak to us in important ways. However, if we are not making a habit of listening, we will never hear that voice. Just as daily exercise and a good diet when I am in Atlanta prepare me to reach the mountaintop when I’m in Colorado, it’s the habitual practice of spiritual disciplines that open my heart for those special times when God speaks and illuminates the path forward. I’m talking about living the Marks of Discipleship: Daily prayer, meditation and Bible study, regular worship, and intentional looking for new relationships that create openings for sharing the love of Jesus, giving of ourselves and our gifts for the kingdom. These practices prepare good soil for the word of God to grow and flourish in our lives. While these practices sometimes create dramatic results, more often, for me, it has been like a plant slowly taking root, needing the right soil, water and sun in order to grow. Like diet and exercise, you cannot just practice for a while, and then quit. It is when these good practices become a way of life that we see the long-term benefit. Slow, but relentless. See a related article, Prepare for the Journey, Storms will Come here.